Sucré – Loner EP: Please just let me go at my own speed. In Brief: A tasty little EP that packs a lot of different moods and sounds into a mere 15 minutes of music. If you like the symphonic and/or beat-driven side of indie pop, give it a listen. 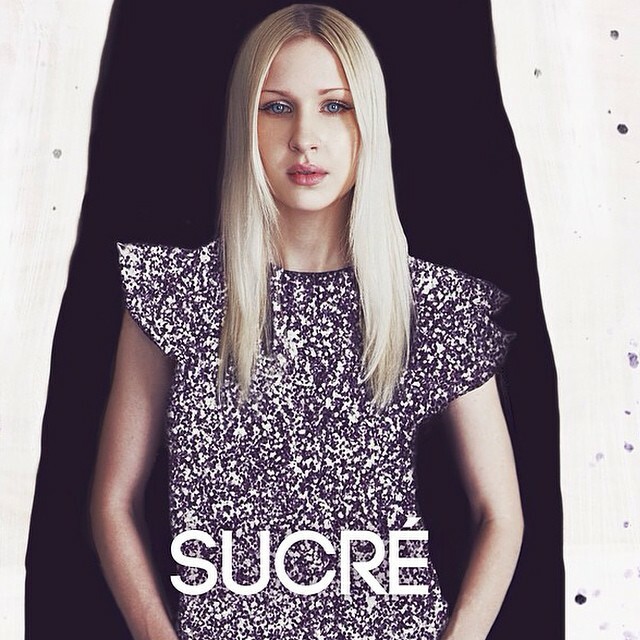 I gushed like a madman about Sucré‘s debut record, A Minor Bird, when it came out in 2012. It was the perfect antidote for the stale feeling I was starting to get from Stacy DuPree-King‘s main musical outlet, Eisley. That band has since redeemed itself with the most excellent Currents, but Sucré, a musical collaboration between Stacy, her husband Darren King, and producer/arranger/apparent-jack-of-all-trades Jeremy Larson, remained a wonderful surprise, a lush and mellow and yet tragically poetic little side project that I honestly never expected to get anything more from besides that one excellent record. So I was quite shocked to find out recently, while looking up the band on Spotify to put a favorite song of theirs on a personal playlist, that they had dropped an EP at some point during the year 2014. It had 5 songs totaling about 15 minutes of music, normally not that much for me to get all that worked up about, but I dived in immediately and it was soooooo good. Surprisingly, this wasn’t always for the same reasons that their debut was. Most of A Minor Bird felt like it was primarily a collaboration between Stacy and Jeremy, as her voice and his multi-instrumental skills carried most of the weight. A few funkier moments were present, most notably “Chemical Reaction”, that reminded us they had MuteMath‘s drummer in the group as well. But for the most part, Darren’s contributions were more subtle. Here on Loner, his beats jump right out at you on three of its five tracks, making it feel like more of a collaboration between Stacy and Darren, but then Jeremy’s work is not to be counted out, as it still lays the foundation for even the most rhythmic of the new songs. The mood here is mostly whimsical, which isn’t too much of a change from their previous work (or Stacy’s overall songwriting style as heard on Eisley’s output), but there’s a bold new confidence to it that wasn’t heard previously. It’s quite a potpourri of styles to cover in such a short amount of time, so “cohesiveness” would be the wrong thing to expect here, but if these were the opening tracks on a full-length album, I could already tell that album was headed for “Grade A” territory. So let’s hope they’ve got songs of a similar caliber up their sleeve for if and when (I’ll keep my fingers crossed) that second full-length ever has the chance to get made, in between everyone’s presumably busy recording and touring schedules. The urgency of this track is almost comical. it’s literally less than a minute and a half long, and for the first several seconds, the strings are all a flurry as if they and Stacy are trying to find each other’s rhythm. They get there soon enough, but the song is still in an awfully big hurry, with her all flustered that she’s woken up alone, feeling empty, and she just wants to get back “to where we were before”. That’s the main hook of the chorus, if you could even call it that considering how quickly it flies by. There’s still room for quite a lot here – a stately horn section, a little bit of fluid piano, and of course Stacy’s commanding lead vocal. When the song abruptly collapses, breathless, in the middle of its second chorus, I can’t help but be amused at how, with little other than a voice and some classical instrumented, Stacy and Jeremy have managed to debunk most of our expectations. The title track honestly sounds like it could have been a MuteMath B-side – other than the vocalist, of course. I mean that in the nicest possible way, because MuteMath has such a gift for matching up-tempo catchy beats with laid-back vibes, and this song reflects that perfectly, making me wondering if there’s such a thing as “chill breakdancing”. There’s a lot of synth and keyboard work here, leading me to wonder if Jeremy decided to step into the world of electronic instrumentation or if this one is purely Darren and Stacy’s baby. (I mean aside from the literal baby they had a few years ago. Who will grow up to be a musical genius, if DNA has anything to say about it.) There’s some incredibly sweet vocal layering in the bridge and outro, too, contrasting nicely with the deep synth breaks. The lyrics describe music as some sort of a heavenly escape from loneliness, and as much as I may have maligned the old “dance like no one’s watching” cliche, this song would be the prefect excuse to do exactly that. Something on this EP’s gotta sound like a throwback to old Sucré, and this one’s pretty much it. It’s not quite as gorgeously tranquil as songs like “Troubled Waters” or “No Return”, but it fits in with a few of the forlorn love songs from those days. Men get to write plenty of songs about women being crazy, and they can range from tongue-in-cheek to downright sexist, but it’s a bit rarer to hear a female songwriter straight-up admitting it. Stacy might be taking a tongue-in-cheek approach here, though, because if you can actually admit you’re crazy, you’re probably not that far gone. Anyway, the dissonance between her sweet cooing and her stern words of warning is perfect, as she tells a guy he’d better grab his gun and head for the hills, because she’s nothing but bad news. The intent here isn’t solely humorous – she sounds as vulnerable as ever when she confesses, “You know I’d hurt us both just to check the pulse”. All at once, I fear her and admire her and feel kinda sorry for her. The final track brings back the beat, though this time instead of relying on programming, they’re marching to the funky beat of a drum line. I’m gonna just go ahead and make a wild guess that this was Darren’s idea, since it reminds me of what MuteMath did on their remix of Armistice‘s title track several years ago. It meshes nicely with the loud horns and whimsical strings and Stacy doing the vocal equivalent of pull-ups as she plucks these incredibly high notes out of the air and yanks them right back down to the earth again. The mood is once again defiant here, telling someone who has been a constant thorn in her side that they no longer have power over her, and if they’re going to take potshots at her for speaking her mind and being her own person, then well, fire away. In a way, it’s reminiscent of what My Brightest Diamond did on her last album, and… oh my goodness, now that would be an amazing double bill for a concert tour! I couldn’t get into their first album, but this EP sounds interesting. I may give it a shot.